Linda Snyder, Membership officer, with preceptee Haley, nurse peer Heather and SEIU coworkers on Ortho Neuro Spine unit today. They are glad ADOs are online now ! Unit rep with nurse and CNA coworkers for SB1155! 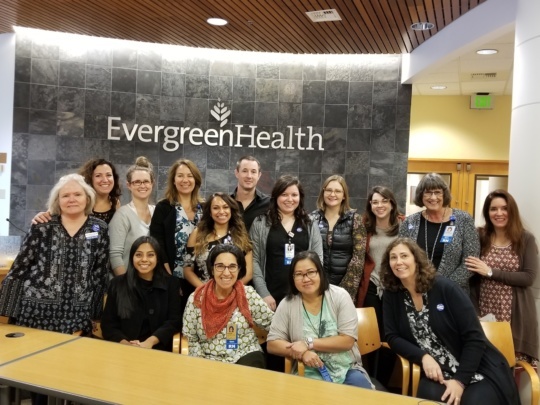 Your EvergreenHealth WSNA local unit leaders are sponsoring ten (10) nurses to attend the Washington State Nurses Convention, May 1-3, 2019 at the Tulalip Resort Casino. Your WSNA Team of Registered Nurses met with Evergreen Administration and Management for the 12th bargaining session on Tuesday, March 12. 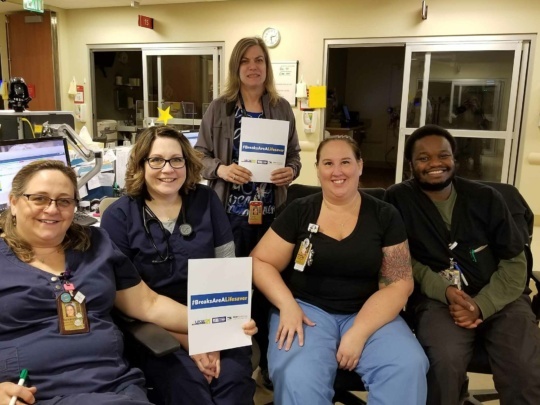 The employer offered a proposal that made slight movement in wages but fell short of the mark in other areas that are of great importance to our bargaining team, such as safe staffing. WSNA is pressing to reach an agreement on improved workplace violence language in addition to protecting Per Diem rights and benefits. Recognizing the hurdles on both sides, we have mutually agreed to seek the assistance of a PERC Mediator and will schedule our next session as soon as is possible for all parties. We encourage all Evergreen RNs to stay involved and let us know if you have ongoing questions or concerns. Your priorities are the driving force behind our negotiations and we are striving to persist until we reach an agreement that is fair and deserving. 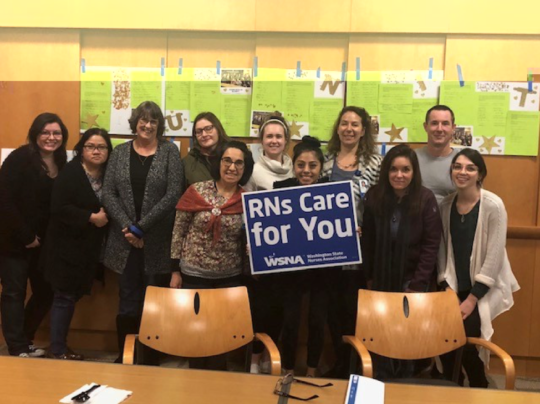 Your WSNA team of registered nurses met on Tuesday, March 5 with the Evergreen administration and management for our 11th contract bargaining session. Both teams exchanged proposals and we made significant movement in order to achieve employer buy-in. Unfortunately, we made no tentative agreements and remain highly divided on wages and other areas that are very important to our team. Our next meeting is set for Tuesday, March 12. We will look to see movement from the employer towards recognizing the value of registered nurses at EvergreenHealth. We will keep you posted of any advancements we are able to make and potential actions needing to be taken moving forward. We value all of the ongoing input and will strive to capture the contract you deserve. Your team of WSNA registered nurses from Evergreen Hospital & Medical Center met with the administration for our tenth session on Monday, Feb. 27. Both parties exchanged proposals and reached tentative agreements in areas such as residency probationary period, personal holidays and vacation scheduling. We will be meeting for our next bargaining session with the administration on Tuesday, March 5 in an effort to make additional movement towards a mutually acceptable contract. 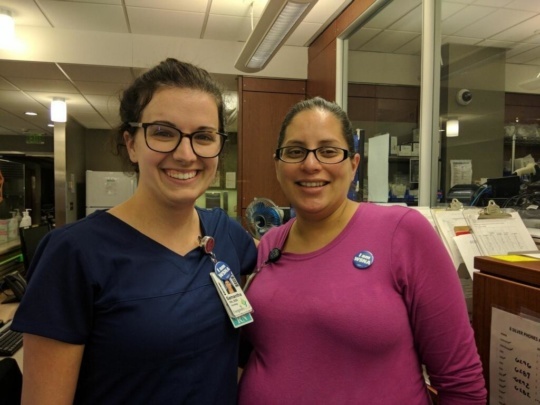 We appreciate all of the support from all of the registered nurses that have reached out and demanded a fair contract and safe working conditions. These principles will continue to be the driver behind our priorities as a team. Your WSNA team of registered nurses met with management for the ninth contract bargaining session on Thursday, Jan. 31. We reached a Tentative Agreement on language regarding our Sick Leave article which added Washington Paid Sick Leave provisions. Per Diems: The Employer wants to increase the minimum monthly work requirements and decrease the associated premium pay. Workplace violence: The Employer does not agree with certain parts of our proposal. We are working to hold the employer accountable to ensure our safety in the workplace. Wages: WSNA offered a fair counterproposal and we are waiting for management’s response. Rest between shifts: Management's proposal is to pay us less when we work without the contractually agreed time off between shifts. WSNA considers this a safety issue related to fatigue due to long shifts. Rest breaks: WSNA believes that each RN is able to determine when it’s safe to take a break. The Employer wants to force us to take breaks when they tell us to. Staffing: We continue to press our proposal to enhance staffing and to ensure meaningful involvement in staffing decisions. We feel we have gained some momentum and plan to keep that going at our next planned session on Feb. 25. We held our seventh session with management in negotiations and were very pleased to post all the support notes and encouragement notes from all of you – our colleagues – prominently for all to see. Thank you for supporting us at the table as we continue in our fight for all of us at Evergreen! We had some good dialogue and exchanged some proposals throughout the day. However, we still have some considerable work to do around key issues. Wages. Throughout the negotiations, we have proposed wages that would lessen the wage gap between our nurses and those of nearby Overlake Hospital. However, management has rejected our proposals and responded with wages that we do not think will attract and retain nurses. Management proposed to reduce the amount of 1.5x pay to nurses who do not receive adequate rest between shifts. We feel strongly this is not in the best interest of nurses or of the patients we serve. Management also proposed that nurses would not be able to refuse when offered a break. We strongly feel that this provides no consideration, regard or respect for a nurse utilizing critical thinking and clinical judgment. This was voiced strongly by all of us at the table explaining that a nurse who has been with the patient all day would know best when to take a break and the primary nurse would also know what information needs to be passed on to the break relief nurse to help provide a safe patient handoff. We also stressed that there needs to be someone available who is qualified and competent to relieve nurses for breaks without altering the staffing matrix. Management feels that if a break is offered, the nurse would not be able to refuse to take the break at that moment. Management continues to insist on increasing the work requirements of Per Diems while also proposing to reduce their premium pay. We have improved staffing language. Unfortunately, we are continuing to receive pushback from management on this issue. We continue in our negotiations and our fight for the best contract that will improve our working conditions, wages and hours for all of us at Evergreen. Please continue to support our team and stay tuned for additional actions all of us can take to ensure that management is aware of our commitment to each other and to the patients and community we serve every day. Join us at a negotiation update session! Drop in at either session to talk with team members and Nurse Rep Ed Zercher! Important next steps include all of us. There will also be refreshments hosted by your Leadership team! RSVP to tbarnes@wsna.org or one of your Evergreen bargaining team members. View the flyer and spread the word! Your team met with management on Friday, Jan. 4. While we have made some substantive progress in negotiations, we still have a lot of work ahead of us. We are pleased to report that we succeeded in getting management to drop its proposal to be able to force nurses to be on standby when they have had the start of his or her shift delayed. 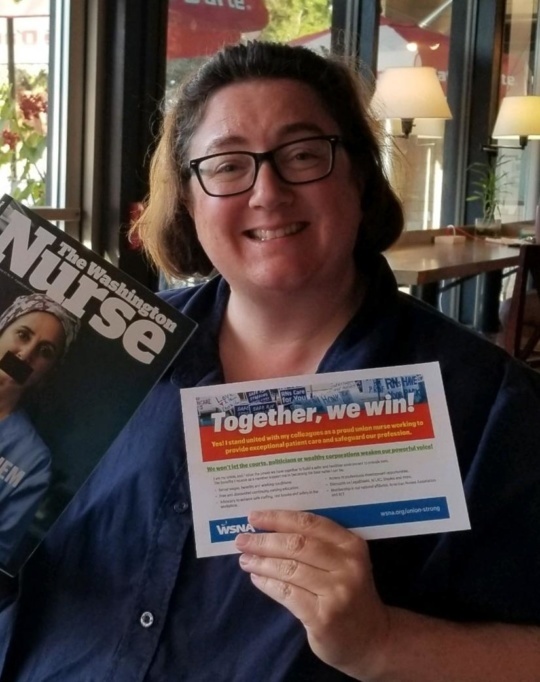 We have continued to stress the fact that Evergreen nurses’ wages are below the wages of many of our fellow WSNA nurses at Overlake and in Seattle. Your WSNA bargaining team has made proposals to close this wage gap. We continue to propose language that will improve staffing and allow nurses meaningful involvement in staffing decisions. Management responded that they would include some general language regarding staffing commitments, but then insisted that any violation of this language could not be grieved! Such a proposal is not reflective of a serious commitment to address staffing issues. We continue to press for enhanced benefits and a comprehensive approach to deal with workplace violence. Our next session is scheduled for Monday, Jan. 14. Talk with at least three nurses about this update. Be informed! Read all WSNA emails and flyers to be the most up to date. Consistently visit this page often to see how strong, unified and active Evergreen nurses have been! Wear WSNA buttons, stickers, representational rights badge buddies and others to show unity – wear them with pride! 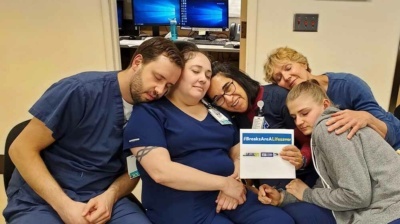 We, your negotiation team and Contract Action Team members, will be asking all nurses to participate in many more actions to support this important work. Answer your team's call to action by saying YES! 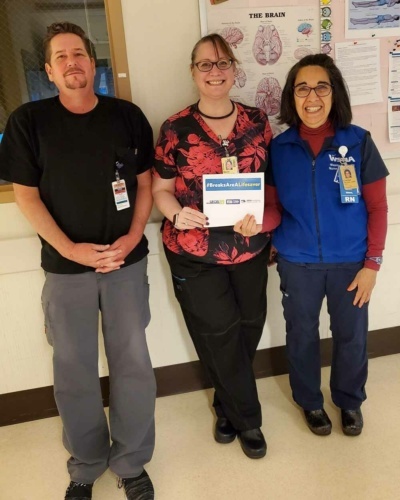 Contact a team member or WSNA Nurse Organizer Tara Barnes, RN to learn how you can support us in moving management on the proposals that matter to the nurses, their families and safe patient care. 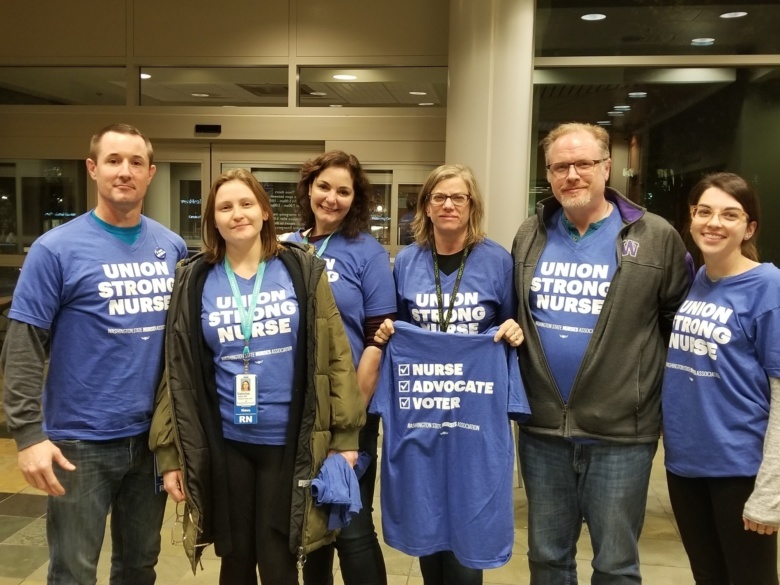 On Nov. 20 at the Board of Commissioners open meeting, in support of the Evergreen Nurses bargaining team, the Board acknowledged the delegation as truly representative of all areas of Evergreen Health. Please welcome WSNA Nurse Representative Ed Zercher, BSN, RN. Beginning Monday, Nov. 26, 2018, Ed will be taking over all new issues as they arise at EvergreenHealth. I will finish up most of the outstanding matters to their conclusion and assist Ed in the coming months, as needed. Ed can be reached at ezercher@wsna.org or 206-575-7979, ext. 3022. It has been a pleasure working with all of the EvergreenHealth RNs for the past three and a half years. I am continuing my work here at WSNA as a nurse representative with a few new assignments. I will miss the Evergreen nurses but know you will be in good hands with Ed. Our team met with management on Oct. 31 and Nov. 7. While we made some progress on several issues, there is still much to be done. We successfully fought off management’s proposals to limit WSNA’s access to Evergreen premises and to require nurses to wear blue scrubs. However, management is still insisting that it be able to force nurses to be on standby when they notify the nurse that the start of his or her shift will be delayed. Currently, nurses have the option of taking low census or being placed on standby. We are still far apart on wages. We have let management know that Evergreen nurses are paid much less than their fellow WSNA nurses at Overlake and in Seattle. Your WSNA bargaining team has made proposals to close this wage gap. Maintain staffing levels so that nurses receive meal and rest breaks and are able to utilize available time off from work. We have also proposed to enhance the staffing committee so that nurses have a greater voice in staffing decisions, including nurses in Home Health and Hospice who face significant staffing issues. To date, management has rejected each and every one of these proposals and has offered no substantive contractual proposal that would address these staffing concerns. We will continue to fight on behalf of our fellow nurses! But we need your help. Be informed! Read all WSNA emails and flyers to be the most up to date. Visit the Evergreen webpage often to see how strong, unified and active Evergreen nurses have been! We are working with the employer to set additional dates to bargain. Stay tuned. We met with the Employer on Friday, Oct. 26 for our third negotiation session. We have presented management with multiple proposals. Management has done the same. Proposals have included economics, benefits, workplace violence, staffing committee, low census, holiday pay and more. The Hospital gave us their economic proposal and we are far apart on wages. We are working hard to assure the Employer is able to retain and attract nurses to care for our patients and to lessen the disparity in the amount of pay compared to other facilities in the area. We proposed a comprehensive staffing proposal which adds strength to the new State Staffing law and (1) includes guaranteed safeguards to force management to vote with nurses on staffing issues and (2) requires that staffing be adequate to assure breaks, vacations, patient safety and health and nurse safety and health. The Employer has proposed that nurses who are placed on low census on their regularly scheduled shift will be placed on Standby, rather than the nurse being given the opportunity to mutually agree. The team does not agree with Mandatory Standby. We still have many open proposals and discussion items. Our next negotiation dates are Oct. 31 and Nov. 7. Can we count you in? Stand with us in unity! We, your negotiation team, invite you to join us in solidarity at the public comment period of the next Hospital board meeting. We are moving forward in negotiations and are calling upon the support of the Hospital Board in a big way for a quality and fair contract that recruits and retains nurses. Our community is counting on us to advocate for safe patient care. Let's bring this message – together. Show that we are united and mean business! Can we count on you to join us from 6 to 7:30 p.m. on Tuesday, Nov. 20 in Tan 250? Invite a colleague to join you! The public comment period is from 6:30 to 7 p.m. Questions? Contact WSNA Nurse Organizer Tara Barnes at 206-713-2241 or at tbarnes@wsna.org for more information. We are in the beginning stages of the negotiation process and have received the employer’s initial proposal. While we are only in the initial stages of bargaining, we have our work cut out for us. We are up for the challenge! Some of the bigger issues are staffing, benefits and compensation. A few other issues include rest breaks, transport nurse and Per Diem scheduling and availability. Our next session is Friday, Oct. 26, stay tuned for further updates. 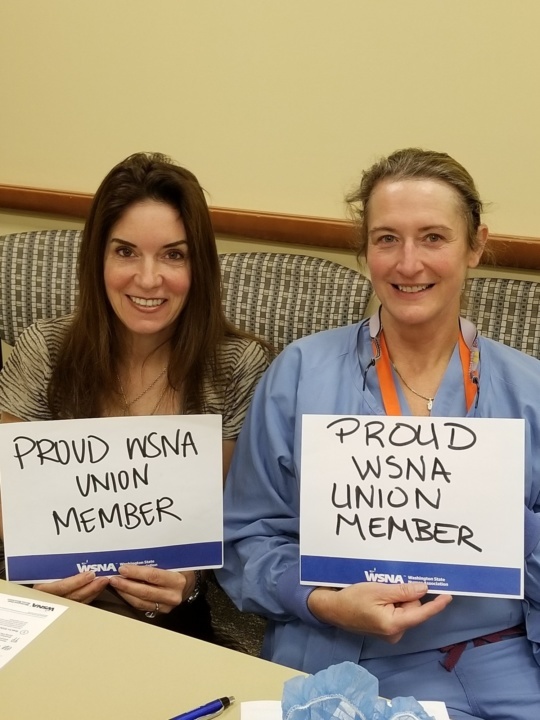 Unity is power—the more active WSNA members we have, the stronger we are at the negotiating table. 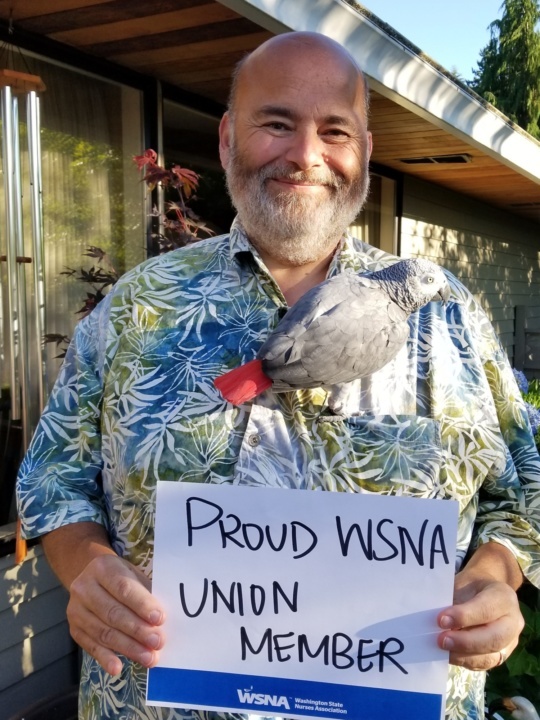 Join WSNA today and get involved in supporting our contract negotiations. Together, we win. Per Diem Home Health and Home Hospice nurses! As you may know, WSNA has filed an Association Grievance which covers Per Diem nurses and, among other issues, the question of scheduling. We understand the nurses in Home Health and Hospice, and most other areas of the hospital, are given choices of dates in a month thatare based on holes in the schedule – after those with FTEs have been placed on the schedule. Negotiations for your Collective Bargaining Agreement are underway and the issues of Per Diems are on the table again. Please complete the 10-question survey to assist our work for this grievance and to help at the negotiation table. We would appreciate your response by the end of the week. Thank you EvergreenHealth nurses for supporting your team! We presented proposals which include language promoting safe and effective staffing, and a wage increase which is competitive and encourages recruitment and retention. Our next bargaining session is on Tuesday, Oct. 16. It’s time to bust out your WSNA swag – WSNA water bottles, buttons, badge pulls, etc.! If you or your unit would like to find out how to support your negotiation team, please contact one of us at any time! Day one of negotiations, complete! Our negotiation team is in place and ready to meet with the employer to make sure we continue to have a strong contract with all of the rights and benefits we deserve. The team has taken part in two prep sessions, one of them with WSNA Attorney Mike Sanderson, who will be our spokesperson at the table. Our priorities have been set by your responses to the negotiations survey and ongoing feedback regarding issues and concerns about our current contract. We will continue to work for a safe working environment and conditions that allow RNs to deliver the safest and effective patient care. The answer simply is every one of us! CAT is an acronym for Contract Action Team. Every nurse at Evergreen is represented at the negotiations table by a team of co-workers. CAT makes communication between the negotiations table, and each of us, timely and seamless. Which allows all of us to be involved and support our team. Each unit has key people who have volunteered to relay messages from the negotiations team to all nurses. Think of this like a phone tree. You should anticipate hearing from CAT and plan on sharing information and participating in activities. For example, CAT may ask everyone to wear a button one day at work to show support for the team. You may be asked to sign a petition or show up to support our team at a board meeting. Likewise, you can share concerns and/or encouragement with CAT and it will be passed on to the negotiation team. We are all in this together to obtain the best contract, provide the best patient care and make Evergreen the place to work. Stay tuned for communication from CAT! 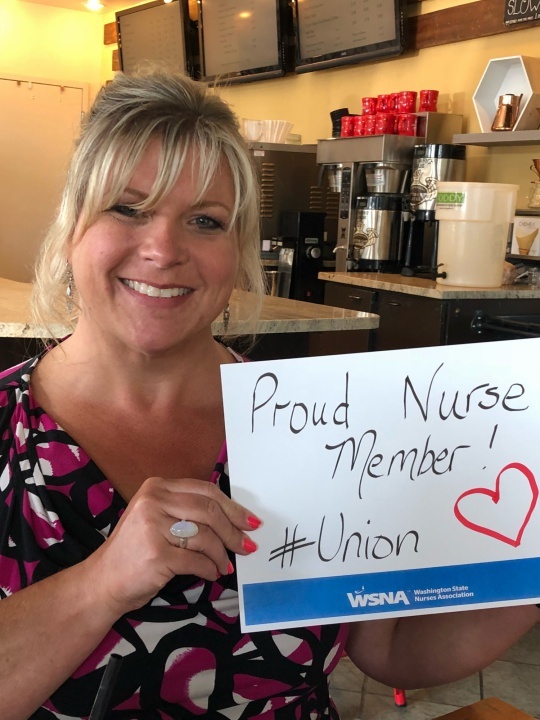 If you are not already a member of WSNA, when was the last time you considered joining our union and professional nurses association? Our membership numbers are already high. Close to 75% of EvergreenHealth nurses are proud members of our local unit. Many of those who aren't members are often unsure what labor unions do, why someone would join or simply don’t want to pay dues, i.e. fair share. A strong and united membership is never more important than when you are in contract negotiations! The reasons why nurses join their union cannot be reduced to any single, uncomplicated statement. Unionized workers have more power as a cohesive group than by acting individually. 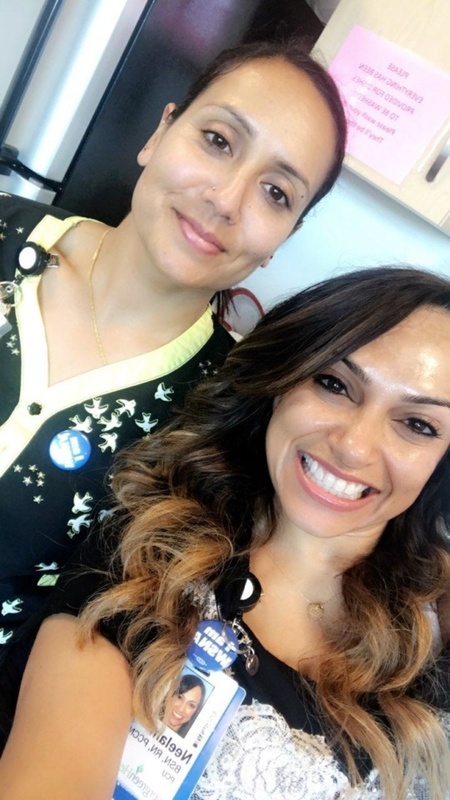 Through collective bargaining, nurses negotiate wages, staffing ratios, health and safety issues, benefits and working conditions with management via our union. Another important reason workers join a union is to ensure fair treatment in the workplace. The nature of nursing is changing. Employers are trying to shed responsibility for many benefits for their employees. As a union member, you have a strong collective voice for negotiating with employers regarding pay and wages, work hours, benefits –including retirement plans, health insurance, vacation and sick leave, tuition reimbursement, etc. The higher the number of paying members, the better we as nurses fair in our contract negotiations. If you are a paying member in good standing and in solidarity with our colleagues –great! If you are not, please take this chance to join now at wsna.org/membership/application. You will be glad you became a proud member of our EvergreenHealth local unit. The right to vote for contract ratifications, in referendums, and in the elections of Officers. Questions? Contact one of the local unit officers or our WSNA Nurse Rep Terri Williams at twilliams@wsna.org. I feel very fortunate to be a nurse, I love helping people and as such I want to help us all have the best working conditions possible; that always equates to our patients best healing conditions. I passionately enjoy my days off; gardening, hiking running, knitting, traveling, being politically active. I have a voice: I am able to speak the truth, and with age its clearer, stronger and willing to risk. My husband of 40 years and I have enjoyed cruises in recent years. 9 cruises including the Panama Canal and the Mediterranean Sea. My first 4-year degree was in Sociology at UCLA 41 years ago. Went into nursing as a second career 15 years later. I am an avid reader and enjoy mysteries and action adventures. A nice break from work! 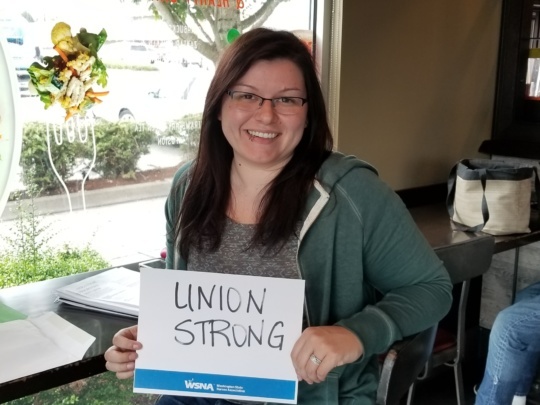 I’ve been a Grievance Officer for several years and have seen first-hand what the union does to solve problems and issues in our working conditions. 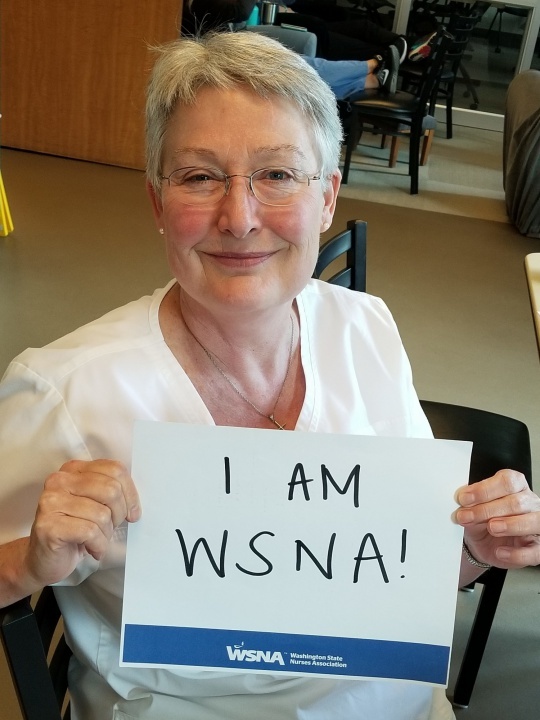 WSNA gives us a strong voice when communicating and working with management. Dog mom to the cutest pup with special needs. I’m passionate about food and my plants. I love watching basketball, especially Kevin Durant! I bake a lot of pies. I’m an avid hiker and cofounded a backpacking company “Cascade Trekking Co.” this year. I went to school in Pennsylvania. I knew I wanted to be a nurse in first grade and told my mother. I competed as an Irish dancer until the age of 15. I was a Rainbow girl and learned many skills about working as a team in the community. I have kissed the Blarney Stone in Ireland and survived! I worked at Evergreen for 12 years and served as an officer and on bargaining team 3 times. Now I follow my passion to help build unity and strength with Nurses as staff. It is such an honor. I’m the token alien as I’m a Canadian citizen. I’ve been a nurse for 33 years in almost every area possible. 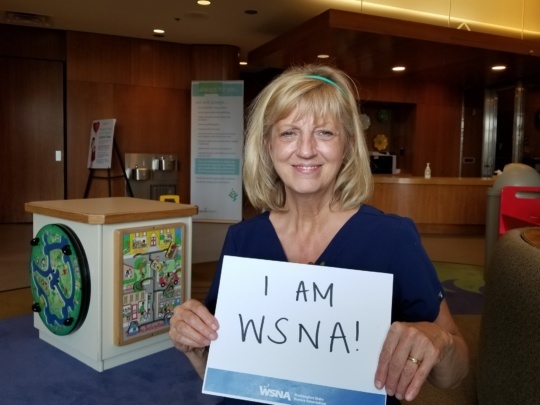 I just left Evergreen this year after 15 years of service because I have a passion for improving the profession for all nurses and felt WSNA would provide the opportunity to leave a lasting impact on the profession. I am happily married x 15 years with 1 daughter and 2 stepsons plus 2 very spoiled feline and 1 fish who actively supports and watches the Seahawks. I became an RN at age 49 (4th career). I’ve officiated over 200 weddings since 2001. I’m a Healing Touch practitioner. I was a WSNA unit representative at Virginia Mason before becoming a WSNA nurse representative. When staffing levels are too low, RNs are frequently forced to compromise the care they give to their patients. Unsafe nurse staffing (including support staff) is a dangerous practice that leads to medical errors, poorer patient outcomes, nursing injuriesand burnout. Ensuring safe nurse staffing must continue to be a top priority for all nurses. In 2017, the Washington state legislature passed the Patient Safety Act, addressing this top issue of safe staffing. The bill creates greater transparency and accountability for nurse staffing plans and the work of nurse staffing committees in hospitals. The new bill holds hospitals more accountable for staffing in order for you to deliver safe, high-quality care to our patients. The Assignment Despite Objection (ADO) form (wsna.to/ADOForm) is the accepted form for the “process” mentioned above. We strongly suggest that you complete an (ADO) form regarding any staffing concerns and issues. These are utilized for real-time tracking efforts by WSNA and the Employer. ADOs are discussed with management at both the monthly Staffing Committee and Conference Committee. To read more regarding other aspects of the new Staffing Law that affect you, visit wsna.org/nursing-practice/safe-nurse-staffing. If you have any questions, please contact one of the local unit officers or our WSNA Nurse Rep Terri Williams at twilliams@wsna.org. Come voice your interests and concerns at a unit specific meeting designed just for us! The work we do is unique, the environment we work in is unique and the challenges we face daily are unique. Join our local unit leaders to discuss the issues important to you. Now is our chance to get our issues front and center before we head into negotiations. We’re unique, but our issues are no less important. Our team won’t know unless we tell them! Your time is important. Let use this time to discuss what changes you’d like to see and how you’d like to be part of those solutions. PACU and Surgical nurses meet for contract action! Evergreen officer, Debbie Pronk and Beth Selander will serve with Charina Alvarez (Charina not pictured) as bargaining team members. All pose proudly after recommitting to membership and discussing department specific issues to bring their voice to 2018 negotiations this fall! April Miller recommits and is a proud member! 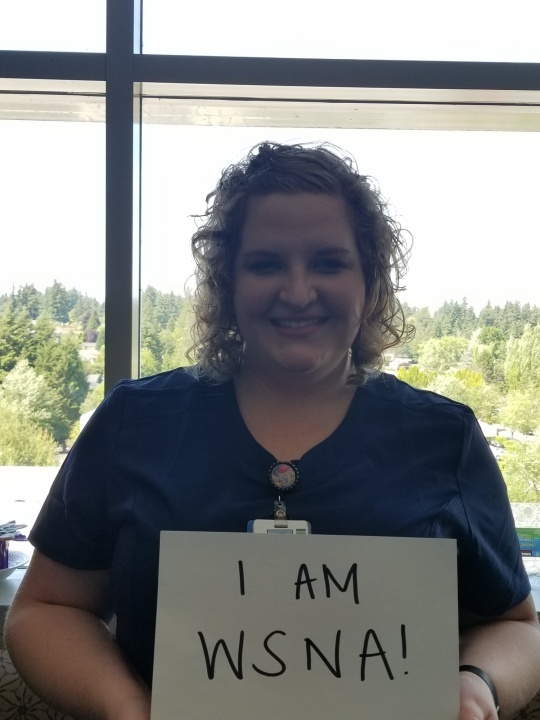 Cate Royston, Home Health RN Intake Coordinator recommits! Home Health and Home Hospice are unique in that patient health information (PHI) is often included in emails. This is somewhat understandable since the nature of your work is in the field but HIPAA requires that hospitals take reasonable steps to protect against sharing of PHI. When sending these emails to staff, management should keep this issue in mind in order to lessen the chances of nurses unintentionally forwarding PHI to WSNA. Recently, a few emails sent to your WSNA Nurse Rep unintentionally contained PHI. The nurses were reaching out to WSNA, utilizing their right to contact the Union regarding issues within the Contract. The PHI was not included in the body of the nurses’ emails but was in an email further down the thread from managers or other nurses. In one case, neither the nurse nor the WSNA Rep knew the PHI was on the thread until it was brought to the nurses’ attention by management. Consider if that email is important, if not, don’t keep it in the thread. The Employer has a LMS module regarding HIPAA, in addition to Policies regarding this subject. Tom recommitted to membership and shared his home for Home Health and Home Hospice nurses to come together and build community and strength for peers and clients. This is part of an ongoing series of regional gatherings for this specialized group as preparations for 2018 contract negotiations. Home Health and Home Hospice Nurses! Did you miss the meetings in June? Did you miss completing the pre-negotiations survey? Your voice is critical! We need to hear from you regarding what is working, what isn’t working, and how to effectively address the following agenda items. Good News! We are continuing the drop in style meetings at new locations near you! Scheduling: Issues with caseloads, daily schedules and assignments, per diem requirements, etc. Missed breaks/working over 8 hours a day. Electronic format for reporting concerns: Better than Safelinq and recognized as the notification of safety events for nurses. Impact of staffing and new staffing law: Yes, there is a venue for raising your voice to impact schedules and the care your patient receives. 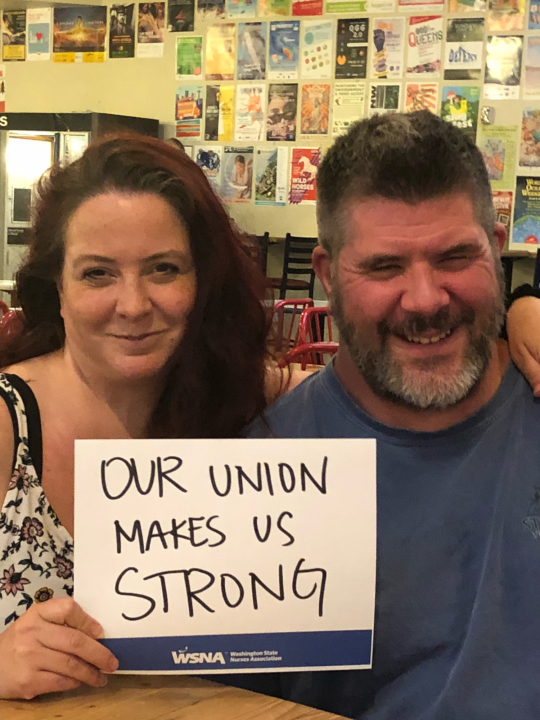 Standing strong together: How we can support each other and present a unified force at the bargaining table to protect ourselves, our families and our patients and to preserve the job we love. Nurses managed by non-nurses: Update on your rights and responsibilities as a licensed professional RN. Wednesday, July 11 – Host: Thomas Sanquino, Hospice RN 4717 149th Ave SE, Bellevue, 98006 – 5 to 7 p.m.
Wednesday, July 18 – Looking Glass Coffee 801 1st Street, #201, Snohomish, 98290– 5 to 7 p.m.
Wednesday, July 25 – The Den Coffee Shop 10415 Beardslee Blvd, Bothell, 98011– 5 to 7 p.m.
Wednesday, August 8 – Peets Coffee 6850 E. Green Lake Way N., Seattle, 98115– 5 to 7 p.m.
Wednesday, August 29 – Soulfood Coffee House 15748 Redmond Way, Redmond 98052– 5 to 7 p.m.
RSVP – and/or call if any questions. Merry recommitted to union strength today. …Per diem nurses are required to be available to work at least twenty-four (24) hours per calendar month, with the understanding that per diem nurses shall not be required to make themselves available to work more than twenty-four (24) hours per month . 17. Per Diem Nurses (Addendum 3) Per diem nurses are required to be available to work at least forty (40) hours per calendar month, including two (2) weekend shifts within those forty (40) hours. Home care nurses: Let’s talk about how to fix your scheduling, overtime and safety problems! As preparation for contract negotiations, ALL Evergreen Home Health and Home Hospice nurses are invited to meet with your local WSNA unit officers and WSNA organizers. We can win needed changes on the issues you’re facing if we all come together. Starting now. Please choose and commit to the meeting that works the best for you and your schedule. SCHEDULING: Issues with caseloads, daily schedules and assignments, per diem requirements etc. MISSED BREAKS / WORKING OVER 8 HOURS A DAY: Did you know you can be terminated for falsifying a timecard? That includes NOT clocking that you missed a break and worked over your time but did not charge for it. RECENT LEGAL WIN BY YAKIMA HOME HEALTH AND HOSPICE: Go to: https://www.wsna.org/news/2018/yakima-regional-home-health-hospice-nurses-win-nearly-2-9-million-for-unpaid-work-hours for details and how this impacts your daily work. Wednesday, June 20 – The Commons – coffee, tea or wine! 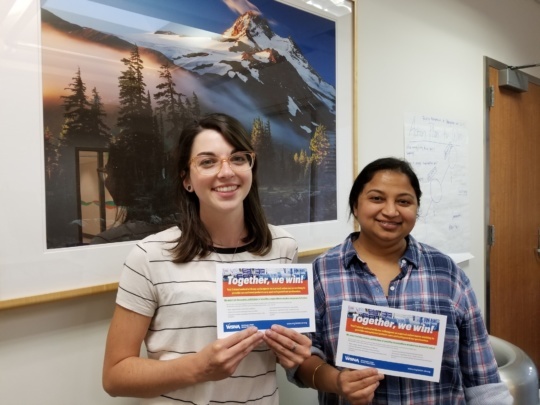 Evergreen Nurses came together to continue the discussion and work to launch your 2018 contract negotiations and the Union Strength campaign to recommit to membership. These new and current activists are really engaging their peers. Together we win! 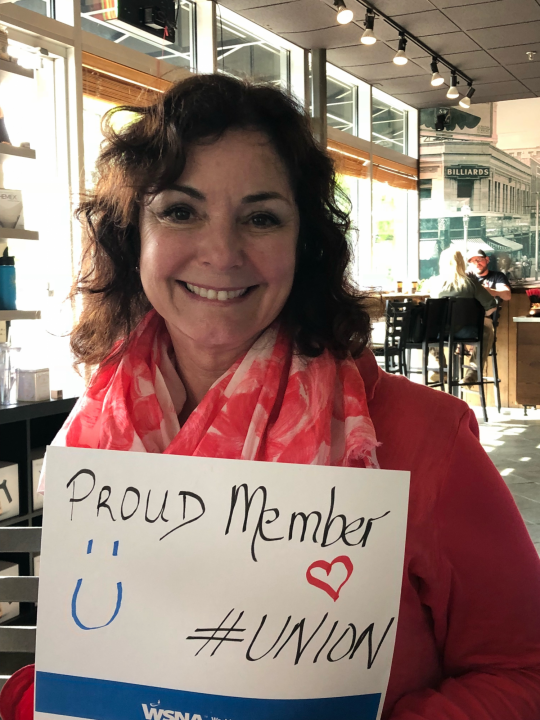 Watch for your negotiation survey coming out in June and complete it so your voice can be heard, and learn more about the recommit to membership campaign your peers will be asking you about at wsna.org/union-strong. Nursing care requires continuous patient assessment, critical thinking, expert nursing judgment, advocating on behalf of our patients and educating patients and their families. These activities are the essence of nursing care and are critical factors in avoiding preventable complications, injuries and avoidable deaths. When staffing levels are too low, RNs are frequently forced to compromise the care they give to their patients. Unsafe nurse staffing is a dangerous practice that leads to medical errors, poorer patient outcomes and nursing injuries as well as burnout. Ensuring safe nurse staffing continues to be a top priority for all nurses. The complaint process mentioned above is the Assignment Despite Objection (ADO) form. We strongly suggest that you complete an (ADO) form regarding any and all staffing concerns and issues. These are utilized for real-time tracking efforts, in addition to discussing them with management at the monthly Staffing Committee and the Conference Committee. There is no language in the Collective Bargaining Agreement (Contract) regarding the Safe Staffing Committee, as the Employer has not agreed to place the language in the Contract when it has been negotiated. Regardless, the law has been strengthened and must be followed by the Employer. If your unit does not have a designated RN to represent you at the monthly Staffing Committee, please let us know if you are interested in being that RN Rep. If you have any questions, please contact one of your Local Unit Officers or your WSNA Nurse Rep. 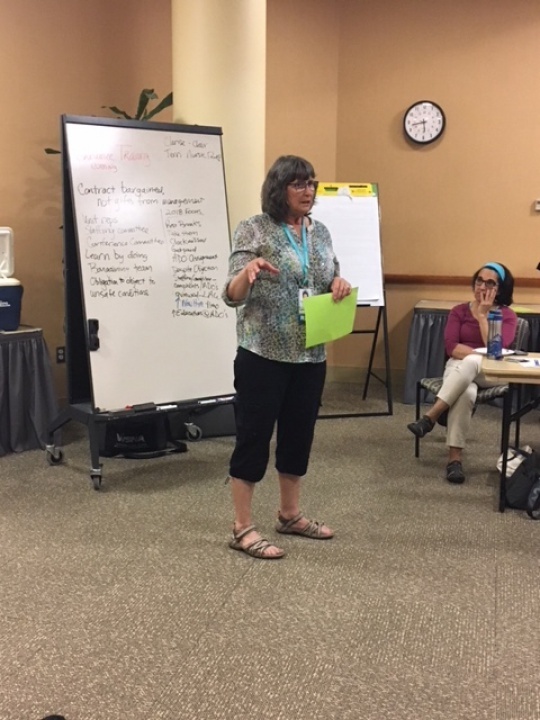 Your bargaining unit officers, WSNA representative and hospital management have worked collaboratively to ensure the language of the contract surrounding low census is followed correctly. The Employer has recently announced that the LaborWorkx system is now capable of tracking voluntary and mandatory low census hours separately. This change took effect Jan. 1, 2017. Your Mandatory Low Census (MLC) hours are limited to (48) hours per each designated six month period. Voluntary Low Census (VLC) hours do NOT count towards this limit. MLC must be assigned using the rotation list on each unit, regardless of whether you have or haven’t taken VLC. a. Agency and Per Diem Nurses first; b. Then, the next nurse on the Rotation List. It is the nurses’ option as to whether they use vacation pay for low census. If taken unpaid, it still counts as credited hours. Learn about the new state staffing laws and earn free CEs while getting your food and drink on. Space is limited, so sign up before Oct. 20 to reserve your seat. Call WSNA at 206-575-7979, ext. 0, or email: wsna@wsna.org. Drinks, food, door prizes, and CEs, what’s not to love?! This dinner is presented by your WSNA local unit officers. It is open to all Evergreen RNs. We encourage non-members to come and find out why they should be a part of WSNA. The Wilde Rover Irish Pub is located at 111 Central Way, Kirkland, WA 98033. You may have received a class certification notice regarding a class action lawsuit, Lee v Evergreen Hospital, Case No. 16-2-27488-9 SEA filed in November 2016. As many of you will recall, WSNA brought a successful missed rest breaks lawsuit against Evergreen which was settled in 2011, resulting in back pay checks, overtime for missed rest breaks and other advantageous terms for Evergreen’s nurses. The new Lee case was not filed by WSNA. Since it seeks damages for missed rest and meal breaks for years long after our WSNA settlement, you are free to participate in the case. If you receive a notice regarding this case, please review it carefully and consult an attorney if you have any questions. The Lee case is one of many based largely on WSNA’s series of landmark precedent setting legal victories in rest break cases, including its landmark victory in the State Supreme Court, Washington State Nurses Association v. Sacred Heart Medical Center. Now, many law firms that are not associated with WSNA have brought similar rest and meal breaks cases that seek to build on the success of WSNA’s precedent-setting victories. On May 3, 2017, the Employer notified all employees including Registered Nurses that they were implementing a Voluntary Layoff Program. This Voluntary Program offers employees a financial incentive to voluntarily choose to end their employment with EvergreenHealth. WSNA met with Management today to discuss this layoff program. Until the voluntary process is completed, we will not know if RNs will be affected by an “involuntary” layoff. The deadline for submitting the Voluntary Layoff Program Application Form to your Manager is Friday, May 12, 2017 by 5:00 p.m. Those who apply will be notified by May 23-26, 2017 as to whether or not they were selected. These layoffs will be effective June 30, 2017. If there are to be any involuntary layoffs for RNs, WSNA will meet with Management again to continue discussion of the process. 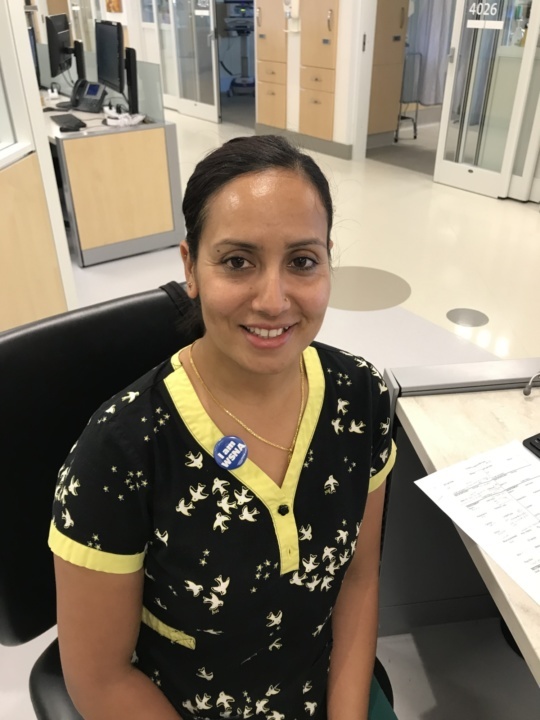 Management has stated they are committed to sustaining high levels of performance regarding quality, safety and patient experience and they will not be adjusting the direct patient-care staffing ratios. Any questions can be directed to Terri Williams, MS, RN, WSNA Nurse Rep at twilliams@wsna.org or one of our Local Unit Officers listed in the "Officers & Nurse Rep" tab. It’s time to have fun, enjoy some quality time with your colleagues and celebrate nursing! Our WSNA Officers and Nurse Rep will be hosting the event for you! Because this is a catered breakfast please RSVP, if possible. Email your RSVP to Clarise Mahler @ hapilark@gmail.com. Don’t miss out on this fun opportunity with your co-workers. Vote was held April 25, 2017 and passed with a Yes Vote! Thank you to everyone who came out to take part in the vote. Calling all WSNA RNs.... VOTE! VOTE! VOTE! WSNA recommends a YES vote on this MOU! The WSNA officers will be on hand to explain the Memorandum of Understanding. This MOU will become part of the Contract. 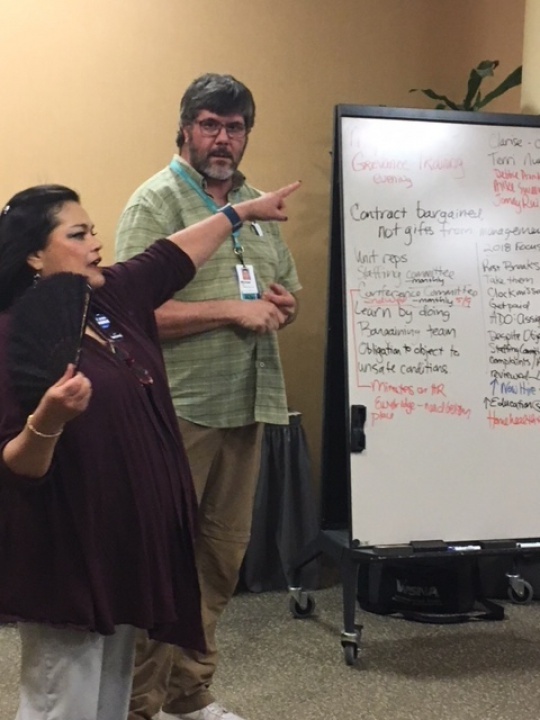 Your Bargaining Unit Officers, WSNA Representative and Hospital Management have worked collaboratively to ensure the language of the Contract surrounding Low Census is followed correctly. You received a Postcard from WSNA on December 7, 2016 related to this issue. The Employer has recently announced that the LaborWorkx system is now capable of tracking voluntary and mandatory low census hours separately. This change took effect January 1, 2017.
b. Then, the next nurse on the Rotation List. The Conference Committee has recognized that some certifications designated for premium pay in varying nursing units have become obsolete for those units. Instead of simply eliminating those certifications and no longer providing premium pay, the CC has decided to designate these certifications as “bridge” certification for those units. Any nurse currently receiving premium pay for these certifications will be eligible to continue to receive premium pay for up to 3 years, provided they maintain their certification. 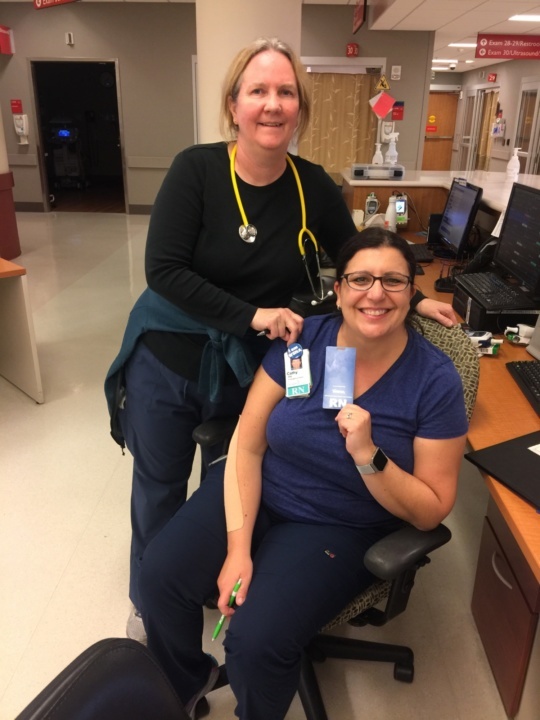 During that three year period, the nurse is encouraged to pursue certification in another area that is recognized as eligible for premium pay, but without the “bridge” designation, in their unit. In addition, the same process will apply to nurses who transfer units in the future. If a nurse has a certification that is eligible for premium pay in their prior unit but is designated as a “bridge” certification in their new unit, the nurse will remain eligible to receive premium pay for that certification for 3 years after their transfer, provided the certification does not lapse. At this time, there are only two RNs who will be immediately affected by this change. Changes will be implemented in January 2017. An email notification from management, with links to department site and list of approved certifications, will be sent out to all nurses this month. 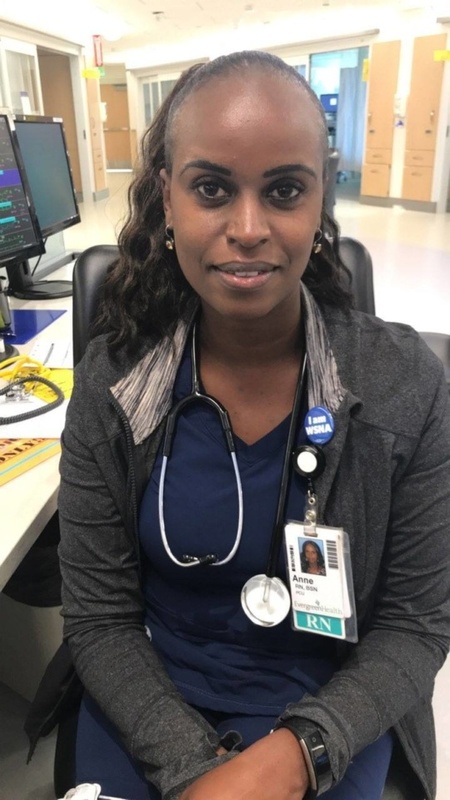 In response to the growing incidence of suicide in the state, the Washington legislature passed a law requiring that nurses and other health professionals complete mandatory six hours of continuing education in suicide assessment, treatment and management. Effective January 1, 2017, WA law (RCW 43.70.442) requires all Registered Nurses to complete this training. The training was discussed at CC, with the Employer stating they were not going to provide the training to the RNs. Their reasoning was that it was not a Hospital mandate but a state mandate for maintaining licensure. We did clarify that Contract language, Article 12.7 Continuing Education, will reimburse the cost of tuition and up to 50% of your regular pay if taken on a day off. The Nursing Commission has issued changes to the nursing continuing competency rules that can be found in WAC 246 840 220. This includes the mandatory 6-hour suicide prevention training requirement. You are not required to submit documentation unless the Nursing Commission audits your license for practice hours and continuing education. You should be keeping a log of practice hours and continuing education to document compliance with legal requirements for licensure in Washington. A current list of Model Programs for the 6-hour requirement for suicide assessment, treatment, and management (in-person and online) is posted on the Washington Department of Health website, doh.wa.gov. Search for “suicide prevention training.” For additional questions, please contact the NCQAC Call Center at 360.236.4700. Then, the next nurse on the Rotation List. Rotation List: A list of the number of low census hours for each nurse will be maintained and be available. The rotation list will be restarted each six (6) months. Nurses will not be required to take more than 48 hours of (Mandatory) low census from January 1 through June 30 and from July 1 through December 31. Voluntary LC is not included in this “cap” but should be recorded on the rotation list. Your unit may have two separate lists: One list for Voluntary LC and the other for Mandatory LC. Selection for low census is subject to skill, competence, ability and availability as determined by the Employer. A traveling nurse who is employed on a contract basis for a defined period of weeks shall participate in the rotation of low census with other full-time and part-time employees. Nurses taking low census shall receive credited hours as provided in Section 4.8 on canceled hours of work for purposes of computing longevity steps, seniority, vacation and sick leave under this Agreement. It is the nurses’ option as to whether they use vacation pay for low census. It can be unpaid and still counts as credited hours. 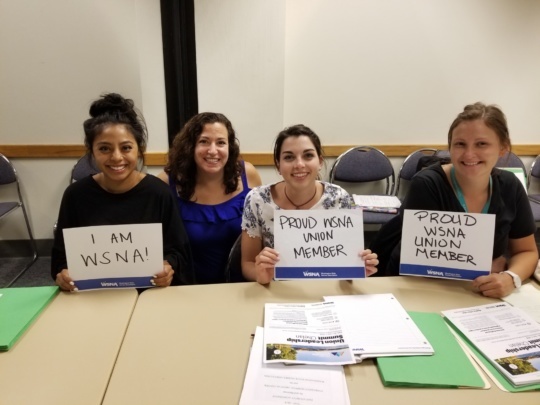 WSNA and two of your co-workers (and Local Unit Officers) met with Nancee Hofmeister and Jessika Groce, HR on Monday, August 29th with regard to our request to meet to bargain an issue. We discussed the major disruption and anxiety the idea of self-scheduling (doing away with your set pattern schedules) has had on your unit and moral. The PACU Unit Staffing Committee has already been formed and has been working on a plan which would allow all nurses (including those who were hired into “variable” shifts) set pattern schedules. Nancee agreed that minimal disruption of staff to meet organizational needs is the goal. We all are looking forward to continued open dialogue regarding this issue. PACU nurses will “trial” the new plans from the PACU Unit Staffing Committee over the next two schedules. We are hopeful these plans will prove to work well and WSNA will be able to close the PACU Scheduling grievance and withdraw from Arbitration. Thank you for quickly taking part in the Survey Monkey regarding Nancee Hofmeister’s plan to change your set pattern schedules to electronic self-scheduling. 70% of you have completed the one-question survey over the last (3) days and 96.15% of you said No! Your voices have been heard! The survey is still open. We are not in agreement with your CNO’s resolution to change your patterned schedules to self-scheduling. Rather than agreeing to change (4) variable shifts to set patterns to make those nurses whole, the Employer has made the decision to change the schedules for all forty (40) RNs on the unit! We agree with you that this will be a huge disruption to your work, family and life balance. WSNA has advanced this Grievance to Step 4 - Arbitration. In addition, we have demanded that the Employer Cease and Desist this unilateral change to the PACU Registered Nurses’ hours and working conditions. We consider this a subject of bargaining and have given the Employer notice that we want to meet. WSNA filed a Grievance for PACU and All Affected Nurses regarding variable schedules. We had been advised that the last five new hires had been hired into “variable positions”. These nurses did not have set patterns to their schedules as did the rest of the staff. We were also told that all new hires were going to be “variable positions” in the future. The Collective Bargaining Agreement does not include the term “variable” and doesn’t support RNs being treated differently than others, which is seen as disparate treatment. 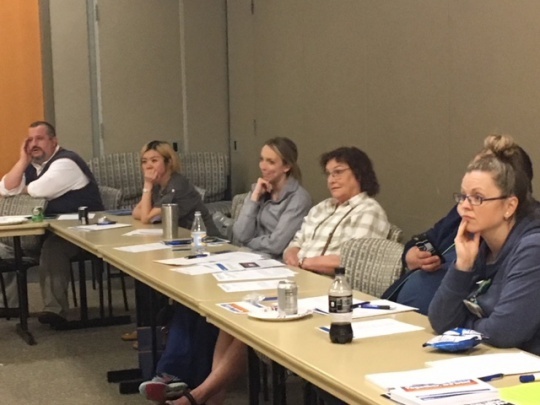 During the Grievance Process, several of the variable position nurses plus a couple of PACU nurses who had set pattern schedules attended the Step Three meeting to discuss the pitfalls of not having a set pattern. The “remedy” requested for this Grievance was that the latest newly hired nurses with variable positions would be given a set pattern schedule and that no variable positions be hired in the future. The Step 3 response from Nancee Hofmeister, CNO was received on Friday, August 5, 2016. Your CNO has not agreed with our requested remedy but has stated, “In an effort to resolve the grievance and balance the needs of the staff with the needs of the department, we will move to electronic self-scheduling for all of the nurses in PACU.” She also states that the grievance response will be shared with all of the nurses in PACU. Please watch for that letter and let us know if you have any questions. Due to this decision that has been made by your CNO, we are concerned regarding the impact this may have on our bargaining unit members, especially your unit. Please take part in this one question survey as soon as possible but no later than Wednesday, August 17, 2016. Free Dinner and CE – Will You Be There? Your WSNA Local Unit Officers plan to host a free dinner for the RNs. Along with the dinner, WSNA staff will present a class for a free CE. If you haven’t received a Doodle Poll invitation in your home email, use this link to get to the Poll. Indicate your interest in attending by marking your available dates. Under Comments, write the CE topic (listed on Poll) you would like to learn. The Staffing Committee needs your input. Now is the time to offer your input, opinions and suggestions for Safe Staffing! Be a part of the solution! Join us this Thursday to let us know what is working for your unit and what is not working. We need details to share with Management when we meet with them again on July 6, 2016. In addition, we’ll be there to hear any other concerns or issues (besides Staffing) that you may want to share with your Officers. This is your opportunity to make a difference. We will have other information to share with you and giveaways! Join Us! 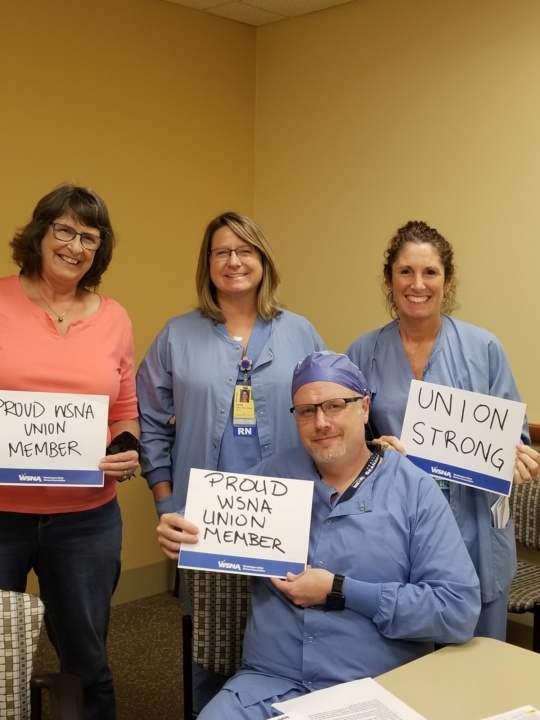 From: Your Local Unit Officers and other RNs representing you on the Staffing Committee and Terri Williams, MS, RN, WSNA Nurse Rep twilliams@wsna.org. 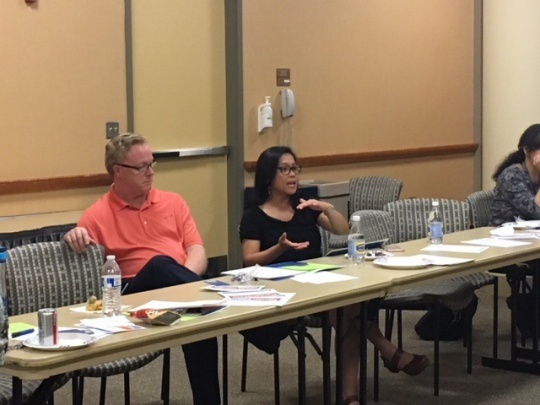 The Safe Staffing Committee met on June 6, 2016 and, among other topics, discussed the Staffing Plan that will be presented for approval to the CEO in just a few months. You are represented on this Committee by representatives from many of the units, the Local Unit Officers, and WSNA Nurse Rep, Terri Williams. HR and Management are also on this Committee. The Committee members representing you need your input. Now is the time to be heard by offering your input, opinions and suggestions for SAFE STAFFING on your unit! In addition, hospital finances & resources may be taken into account. Be a part of the solution! Join us on Thursday, June 30th to let us know what is working for your unit and what is not working. We want to have details to share with Management when we meet with them again on July 6, 2016. In addition, we’ll be there to hear any other concerns or issues (besides Staffing) that you may want to share with your Officers. If you will not be on campus that day or can’t drop-in between these hours, email your input/suggestions/opinions for nurse-to-patient ratios, along with your rationale, to: Terry Jorgenson, RN; Co-Chair, teamjorg@frontier.com or Terri Williams, MS, RN; WSNA Nurse Rep twilliams@wsna.org. Hours spent in attendance at the Conference Committee shall be paid at the nurses’ applicable rate of pay. We’re looking for (3) additional RNs to sit on this committee. If you’re interested in joining the Conference Committee, contact your WSNA Nurse Rep at twilliams@wsna.org. Please take a moment to peruse the Contract, download it to your phone and bookmark it on your computer! Let us know if you have any questions. We extend a heartfelt Thank You to the out-going Officers, Gerrianne Nicholls and Aurea Herman for their time, hard work and efforts representing the Bargaining Unit. They will continue to volunteer with the Local Unit as Unit Reps. The 2% increase for all nurses will be in effect at the start of the current pay period starting 2/14. This increase will appear for the first time on the paycheck issued 3/4/2016. The retro pay, back to 11/8/2015 (start of the first pay period after 11/1/2015), will be on the paycheck for the next pay period, which starts 2/28. That paycheck will be issued 3/18/2016. When you provide your Manager with your “available” dates to work on your next schedule, if you are not needed on any of those dates, you do not need to provide any additional dates. You have fulfilled your contractual obligation when you give your initial availability. If you want to volunteer for other dates to work, that is your option, but it is not mandatory. The actual Contract language is pasted below. Please Submit Your Nominations For Local Unit Officers! Send your nominations for Officer Positions to twilliams@wsna.org no later than February 22, 2016. State name of the RN being nominated and the Position for which they are being nominated. We held a vote on Monday, February 8th, 2016 with a great turnout of RNs casting their vote and giving their support and encouragement for our negotiation efforts. This Contract was approved by our RN membership by an overwhelming majority! Thanks to everyone who voted – your voice matters! And, thanks to everyone that spoke with their colleagues who were non-members and educated them on the importance of membership. We had two non-members come to the vote to Join and others who left with Membership Forms. We also had four RNs step up to become reps for their units. 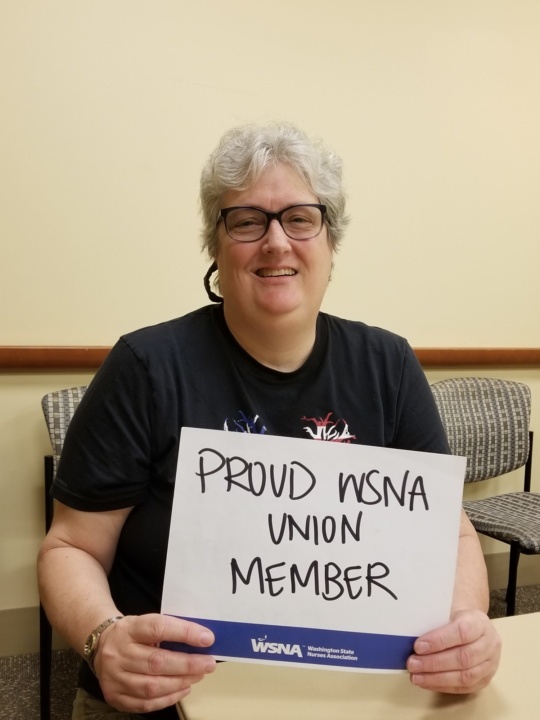 RNs are standing up and stating that everyone receiving raises, increased benefits and the security of having a Collective Bargaining Agreement should join WSNA and become a member today. The reason that we held off so many of the employer’s proposed takeaways is a direct result of the amount of member engagement we had and our membership numbers. Never Forget: Together we bargain! Divided we beg! Watch for upcoming news regarding Local Unit Officer elections and your chance to be a Unit Rep for your area! • You must be a WSNA member “in good standing.” This means any past dues must be paid in full and those who join as a member at the vote must pay 3 months dues in advance. Additionally, “Fair Share” fee payers are not members and so are ineligible to vote. • You must bring some form of identification with you to vote - your RN badge will suffice. • One person, one vote, in person only. There is no voting by mail, email or proxy. After seven sessions, WSNA and the Employer have seen a degree of moving forward on numerous issues. WSNA and the Employer are not in agreement regarding our key issues, including Economics, PTO/EIB, and changes to Per Diem language. The vast majority of WSNA area hospitals have Sick and Annual Leave and with good reason. It allows nurses who are sick to stay home. Under Management’s proposal, nurses will now have to use time that could have been used for vacation and will not be able to use some of their “sick” leave unless they miss more than (16) consecutive hours of work. This is especially hard for part time nurses. Also, nurses will never know how much time they actually have for vacation because they must guess how many days they will be sick to plan accordingly. Imagine that you have a vacation planned or that you or your family members go through a rough period and you end up taking time off for illness, you may not have enough accrued PTO for your planned vacation; and we certainly don’t want anyone coming to work sick. These are some of the reasons why nurses at Evergreen have consistently rejected Managements dangerous PTO/EIB proposals. They know, as do the vast majority of WSNA nurses around the area, that accessible sick leave is important. Article 11.6.1 - Conversion of sick leave to cash. The only Hospital within the Seattle area with PTO/EIB is Overlake. Other WSNA covered hospitals, such as Virginia Mason, University of Washington, Seattle Children’s, and Northwest continue to have Vacation and Sick Leave – for good reasons! Non-WSNA hospitals, Swedish and Harborview, also continue to have Vacation and Sick Leave. The majority of WSNA hospitals within the state do not have PTO/EIB. Lastly, PTO/EIB is not compatible with maintaining and balancing personal and work life. Management is proposing an additional half percent increase (in year (3) of the Contract) across the board. If HCAHPS scores are over a certain percentage. In essence, pitting this non-guaranteed wage increase on the Hospital meeting nursing communication performance targets. We can only assume that Management believes that Evergreen nurses have all the tools and staffing support for the Hospital to meet these goals. Meanwhile, nurses inform us about staffing problems at Evergreen. Management fails to recognize that nurses are professionally driven and that, given the proper tools and support, provide exemplary care. Other area WSNA hospitals understand this. They guarantee full wage increases for the life of their contracts while facing similar Medicare and Medicaid reimbursement constraints as Evergreen. 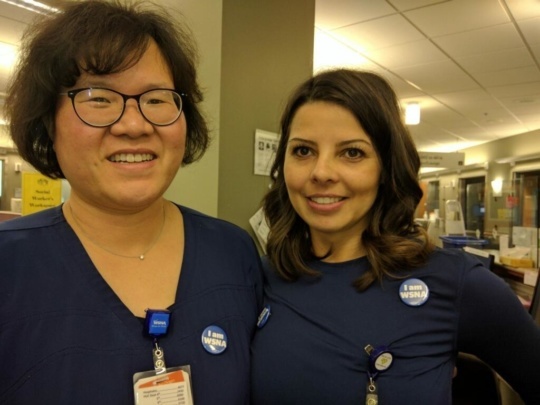 We fear that Management’s dangerous “new idea” approach to compensation will give Evergreen nurses yet another reason to look elsewhere for employment where they may earn a better wage and can count on guaranteed, full wage increases. In addition, the Hospital’s economics proposal is conditioned on WSNA acceptance of the new language on PTO/EIB! Current Contract language, Addendum 3 - Per Diem Nurses, requires these nurses to be available to work at least (24) hours per calendar month. One of the reasons nurses work per diem is because they do not want to work an FTE position. The continued adding of hours to work, availability gets further and further away from what a per diem nurse should be. Per diem nurses should not be utilized to handle staffing issues – that focus should be on core staff. We want to keep the great, hard-working per diems we have at Evergreen. Adding to their availability will only make other area hospitals more attractive to them. Your Negotiation Team is working hard and diligently for you! If you have any questions, don’t hesitate to reach out to one of the team members or the WSNA Nurse Rep Terri Williams. We are always interested in staff input during the negotiation process. Terry Jorgenson, RN (teamjorg@frontier.com); Sue Dunlap, RN (sadunlap1963@gmail.com); Aurea Herman, RN (aureaherman@gmail.com); Becky Brandt, RN (rnauntb.becky@yahoo.com); Beth Selander, RN (beth.selander@comcast.net); Charlotte Hingle, RN (marianbeckham13@gmail.com); Cindy Collette, BSN, RN (cdclltt4@yahoo.com); Clarise Mahler, RN (hapilark@gmail.com); Lexi Overa, RN (lexi.rn@hotmail.com); Linda Larsen, RN (lindabike@comcast.net); Lisa Traynor, RN (62hummingbird@gmail.com); Merry Doty, RN (mkandcomp@hotmail.com); Sheila Page, RN (sheilapagejm@comcast.net); Theresa Blazer, RN (tmblazer@hotmail.com). Your Negotiations Team met with Management for their fifth and sixth sessions on November 12th and 20th. Although we have reached a tentative agreement on a couple of issues, movement has been very slow. Our future Negotiation dates are scheduled for December 9th, January 14th and January 29th. Stay tuned for more details after our session on December 9th. Your Negotiations Team met with Management for their third and fourth sessions on November 4th and 5th. 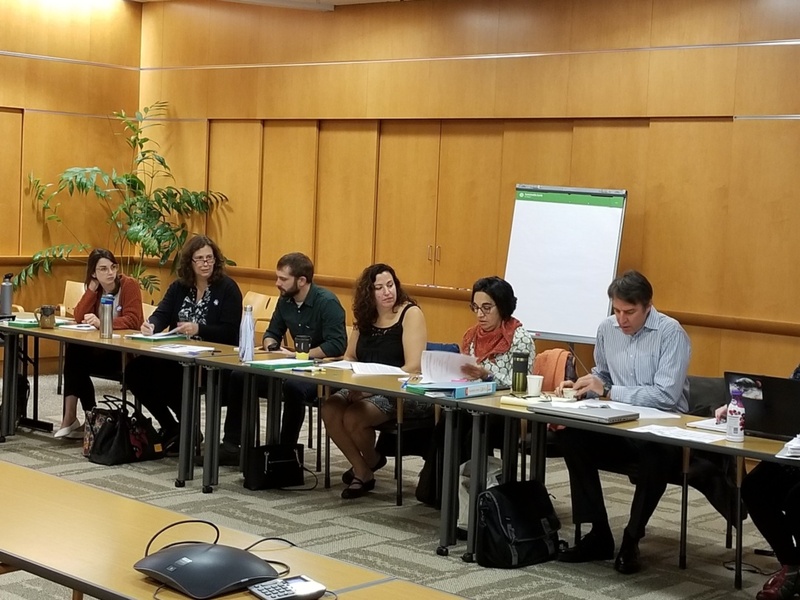 We have reached a tentative agreement on a couple of issues but are having slow movement on the major issues, including: PTO and EIB; new probationary periods that will include long term employees; and negative changes to overtime. Management has stated they intend to bring an economic proposal to the table at the next session. We have only one additional Negotiation session scheduled which will take place on Friday, November 20, 2015. We are working with Management to set future dates. Stay tuned for another update after our session on the 20th. Our next two Negotiation sessions are scheduled for November 4th and 5th. Stay tuned for another update after those sessions! 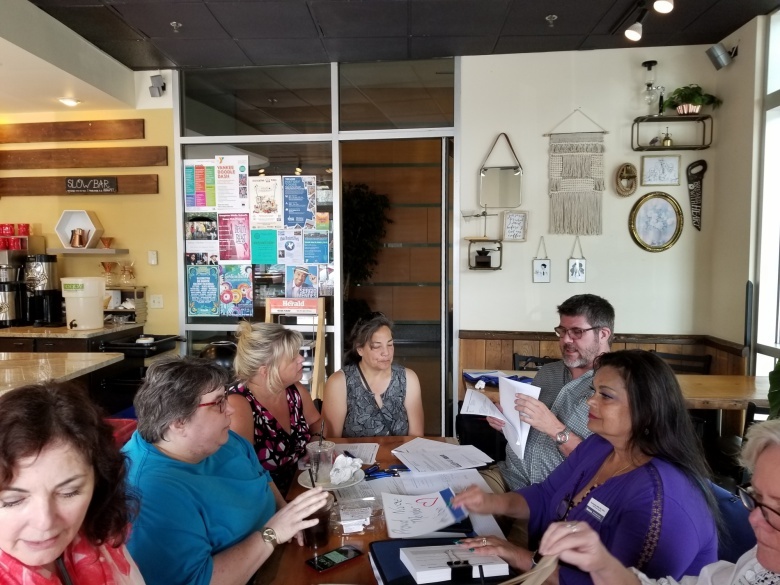 On Monday, October 12, 2015, your Local Unit Officers, WSNA Nurse Rep and WSNA Attorney met with Management and their Attorney to begin the Negotiations process for a new Collective Bargaining Agreement. Our team presented them with our proposal. Management has committed to giving us a response at our next meeting on October 20, 2015. Stay tuned for updates after that session. Many thanks to your Officers and co-workers who have volunteered to serve on the Negotiations Team! Terry Jorgenson, RN (teamjorg@frontier.com); Sue Dunlap, RN (sadunlap1983@gmail.com); Aurea Herman, RN (aureaherman@gmail.com); Becky Brandt, RN (rnauntb.becky@yahoo.com); Beth Selander, RN (beth.selander@comcast.net); Charlotte Hingle, RN (marianbeckham13@gmail.com); Cindy Collette, BSN, RN (cdclltt4@yahoo.com); Clarise Mahler, RN (hapilark@gmail.com); Lexi Overa, RN (lexi.rn@hotmail.com); Linda Larsen, RN (lindabike@comcast.net); Lisa Traynor, RN (62hummingbird@gmail.com); Merry Doty, RN (mkandcomp@hotmail.com); Sheila Page, RN (sheilapagejm@comcast.net); Theresa Blazer, RN (tmblazer@hotmail.com). Your Local Unit Officers and WSNA Nurse Rep Terri Williams have been contacted by many nurses regarding the excessive amount of texts and robo-calls they have been receiving regarding working extra shifts. This issue was taken to the Conference Committee last week. You can opt-out of the Everbridge Staffing List by emailing the Department Staffing Office and ask to be taken off the list. You will no longer receive Everbridges for staffing but will remain on the system for all other hospital emergency messages. After more than 6 years of representing the wonderful WSNA nursing staff at Evergreen, I am stepping into a new role at WSNA as the Nursing Practice and Policy Specialist. Please watch for further updates about this new role in the Washington Nurse. Terri Williams will be assuming the role of your Nurse Representative. Terri has previously been with WSNA for 3 years as a Nurse Representative. I’d like to extend a big thank you to your officers, unit reps and committee members for their hard work in helping me to represent you at your facility. I know that together with Terri, they will continue to do a great job representing you. As always, WSNA is your resource for any questions related to your contract as well as any topic covered under wages, hours and working conditions.